His name is synonymous with garlic, and his signature recipe — a plateful of marinated garlic wings, charbroiled and smothered in a potent garlic-lemon sauce — has seduced Seattleites for decades. He’s Kamal Aboul-Hosn, whose original Mediterranean Kitchen made its debut on Lower Queen Anne in 1981 and whose latest effort, the new Mediterranean Kitchen on First Hill, has been open six weeks. 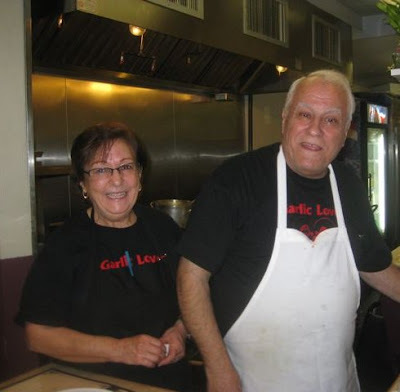 Kamal Aboul-Hosn and his wife, Ghada, profess their love for the stinking rose on their T-shirts at the latest incarnation of Mediterranean Kitchen, near the corner of Boren and Madison at 1009 Boren Avenue. Eyes on the prize: wings, coming in for a landing. Use your hands — and bring some Altoids. Keeping up with Kamal, and with the history and trajectory of his restaurants (there have been many), has been no easy feat. “I remember eating those wings at Kamalco,” I told him, harkening back some 20 years. He explained that Kamalco (you might know it today as the Capitol Club) started out as his, but that he turned it over to his brother. The Bellevue branch of Mediterranean Kitchen, open since 1995, is owned and operated by his son, Bessam. After 13 years working at his snug cafe at 4 Roy Street, recalls Kamal, he relocated to larger, more prominent quarters across from the Opera House. Last I’d heard, he’d closed up shop there in 2006 and retired. But it turns out I didn’t have my story straight. 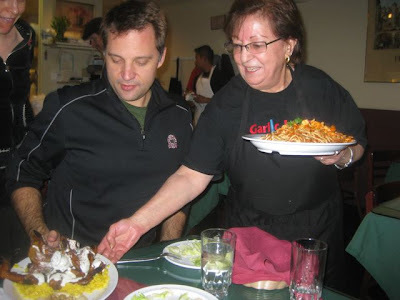 In 2005, prior to closing the Seattle version of Mediterranean Kitchen, Kamal said, he opened Pizza Brava in the U-District, serving a combination of Mediterranean fast-food (gyros, falafel) and pizza. “When I found the pizza [sales] was doing good, I changed my mind about the Mediterranean food.” He stopped serving it, though he kept a couple of popular items, including zahra (fried cauliflower with tahini) and the garlicky wings. Pizza Brava sold this year (it’s still up and running), and once Kamal found “a nice location” for a 30-seat cafe — voila! — Mediterranean Kitchen was back in business. Come and get it: shwarma, shish tawook, kabobs and more! The cafe and kabob house, open Mondays through Saturdays from 11 a.m. till 8:30 p.m., is already doing a brisk lunch business, thanks to proximity to Swedish and other nearby medical facilities, and longtime fans can find what they’re looking for (including a long list of modest-priced lunch specials). What they might not be able to find is easy parking, said Kamal, lamenting that, so far, that’s the only problem he has with the new location.